I made this card for this week's CAS-ual Fridays Challenge #10. The challenge was to make a shaped card. I decide to make this bird shaped birthday card. Thanks for stopping by and taking a look! Love your adorable bird, Donna! The party hat is perfect! Love the pretty colors and the party hat, Donna! So darn cute! Thanks so much for playing with us at CAS-ual Fridays! This is adorable! What a fun card, just makes me want to smile. Great details, all the way to the pom pom on the hat! 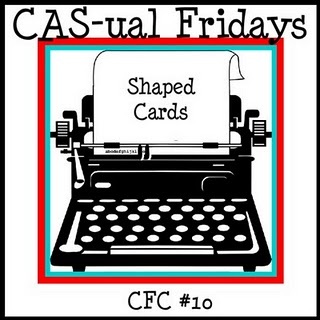 Thanks so much for taking on the challenge and joining us this week at CAS-ual Fridays! Love that bird and the bright colors! Thanks for playing along with us at CAS-ual Fridays! Absolutely adorable Donna and so fun and cute!